Assemblymember Bill Colton and Democratic Party District Leader Nancy Tong presenting Lilia Salima Ahmed with her award of distinction. Assemblymember William Colton held his annual Women of Distinction Awards as part of International Women’s Month on Sunday, March 24 at the United Progressive Democratic Club at 29 Bay 25th Street in Bensonhurst. The pol, whose assembly district includes Bensonhurst, Gravesend, Bath Beach and Dyker Heights, asked that all nominations for prospective honorees be submitted no later than March 15. From that group, over 50 extraordinary women were chosen and recognized for helping to make their communities better. Colton, in conjunction with United Progressive Democratic Club President Nino Magali and 47th Assembly District Leader Nancy Tong hosted the ceremony and luncheon. 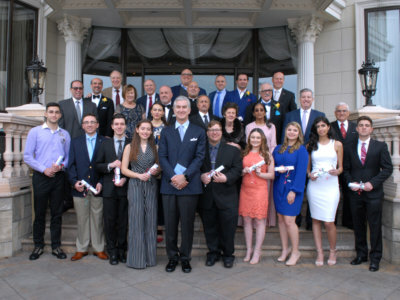 Bronx Borough President Ruben Diaz Jr., a representative from U.S. Rep. Max Rose’s office, Zunera Ahmed, and Ari Kagan from Scott Stringer’s New York City Comptroller Office were among the over 150 people who came to celebrate the honorees. For the first time this year the event included a showcase from the Pesvebi Georgian Cultural Center with dance school students as young as four years old performing traditional Georgian dances such as the Adjaruli.